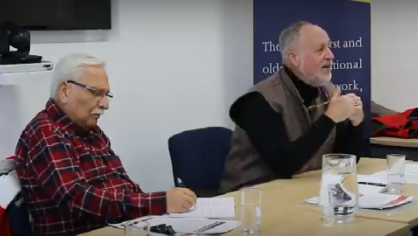 UNESCO Co-Chairs Drs Hall & Tandon delivered a talk on the importance to build Knowledge Societies for achieving the Sustainable Development Goals, at the ACU in London on April 26, 2018. They shared about their efforts in pushing forward the movement of knowledge democracy and the importance of recognition of multiple epistemologies of knowledge therein. They also spoke about the trends of ‘engagement in higher education’ and ‘co-construction of knowledge’ and their evolution over time. They shared with the audience about the Chair’s recent ongoing initiative of Knowledge for Change (K4C) and how it aims to build local capacities in Community Based Participatory Research by enabling local teaching and learning of the same.